Blue Sky Five Inch Double Points are back, and they're more exquisite than ever! Made from reclaimed wood, these needles are hand-lathed from Dalbergia Rosewood (also known as dark rosewood). They're polished up to a brilliant luster that shows off the gorgeous grain patterns without the use of harsh chemicals. 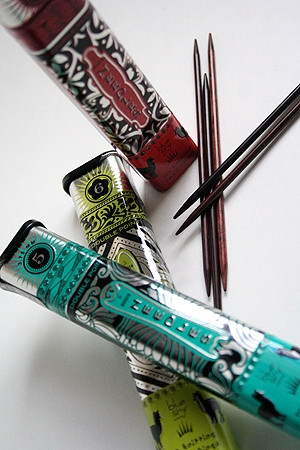 Not only are these needles gorgeous, but you can also feel good about buying them! They're handcrafted by highly trained and skilled artisans in Vietnam who work in family-owned and managed businesses that offer training and opportunity to their workers. Your purchase helps the workers earn a livable wage and contributes to an educational trust fund for their children. Available in sizes 0-6, these petite needles come in one of our award-winning tins, with a different color and design for each size. You can collect them all and feel good doing it! per set of 5 needles. Sox Sticks, Handpainted Sock Yarn, and a great sock book.